i got bored and drew these. 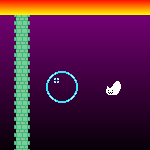 not entirely sure if I'd actually make a game because I'm working on a bigger project, but whatever. 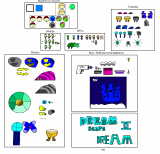 it would be amusing if somebody would actually make a game using these sprites. Taken down from the games section because I didn't want to get anyone mad. Oh my! I'm making a BLOODY HUGE game in MMF2. As of now, there are 5 worlds and 2 bonus stages. This project is in collaboration with RobGBA, who made "Yong Yong's Revenge", in which he will be doing the Art and the FMV Cutscenes. Yes, this game is basically a Youtube Poop-based game, but based off the less-overused sources. -(Going to be) 8 WORLDS! -BONUS STAGES THAT CHANGE THE ENDING IF YOU CLEAR THEM ALL! -SPRITES EITHER STOLEN OR MADE BY SAID PERSON ABOVE! -ACTUAL CONSISTENCY WITH THE GAMEPLAY! COMING SOON TO A PC NEAR YOU! PIRATE CARD OFFICIAL ENTRY NO. Are you ready for intense action? There will be 16 playing cards, will be the creator who will? Play to get! Enjoy the world! Make game for SMEDX Rainbow console of plays! Justice Mustache: The Future of it. So, yeah. I released Justice Mustache: Christmas Caper a few days ago. I tried my best on adding variety for the bosses. Not sure how it's going to go with Zecks, but that's beside the point. As you saw earlier, I tried making an ARG relating to Justice Mustache 4, and I gave up because I, as mentioned earlier, was too lazy to make it. Not sure how the future of the series is going to go. Can someone help? Eater of meaning attacks GT? I was logged out earlier and noticed alot of the words were eater-of-meaning-ized.